Look at that thing. Just look at it. 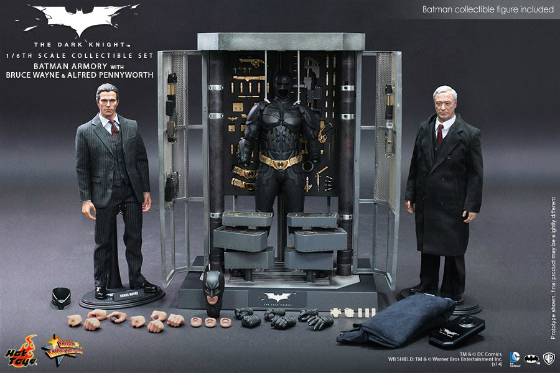 And the two figures it includes (the Michael Caine recostuming possibilities alone are endless, and Bruce Wayne can double as Patrick Bateman, who’s only one letter away from Batman, after all). If you look really closely, you can even see that those interchangeable mouth/jaw pieces work not just for the masked Batman head, but the Bruce head too, which I think is a first for Hot Toys. Anybody want to give me the $600 or so that this is likely to cost? "Christian Bale" "Christopher Nolan" "Dark Knight" "Hot Toys" "Michael Caine"